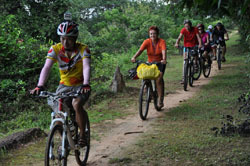 Cambodia Cycling aims to provide once in a life time adventure tours with real life experience. 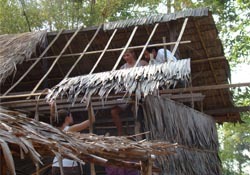 You will enjoy local food, experience Cambodia at its most authentic with combination of our culture and history. Below are some of the comments we have received from our guests. In order to improve our services, we appreciate all the feedbacks. 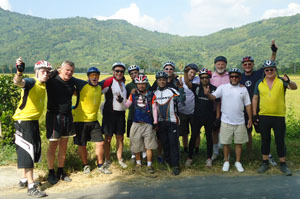 July 2012 I had the experience of a lifetime thanks to Cambodia Cycling. I undertook the 8days/7nights cycling tour from Siem Reap to Sihanoukville including two days exploring the sites around Siem Reap including Angkor Wat, Ta Prohm, Bayon and Banteay Srei. 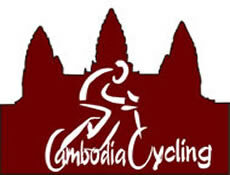 Whilst doing reseach for my trip I found Cambodia Cycling online and was initially a little hesitant about going with a company I knew nothing about, but on contacting Cambodia Cycling I found Mr Hun Socheat to be thorough, cordial and extremely efficient in replying to emails, so I took the gamble and wow did it pay off. Mr Hun Socheat was able to guarantee my tour and also willing to make alterations to suit my needs. In the end I was the only person on my tour due to a couple cancelling at the last minute and although I must admit leaving Australia a little hesitant at the thought, from the moment I met the staff from Cambodia Cycling I knew I was in good hands. I would recommend Cambodia Cycling to anyone who is looking for a tour with a difference, I am not overly fit, so don't think that you need to be an athlete to complete this tour. I will definitely be back to do another trip with Cambodia Cycling in the future!! My wife and I did the Angkor to Saigon route which was 10 days and 9 nights. The tour was incredible and very well organised. I wouldn't hesitate to recommend Cambodia Cycling to anyone. Our Cambodian team in particular of Bouen and our driver Dee were fantastic. Bouen's passion for his country and cycling were evident in the friendly, knowlegeable and professional manner in which he lead the tour. He is easily the best guide we've had for any adventure tour anywhere. It was particularly great to be able to explore the back roads and paths which we would never have been able to do ourselves. We'll definitely be back to see more of South East Asia on a bike. My friend and I wanted a trip that involved more than just sitting on a tourist bus. Being fit and healthy, we decided on a cycling trip through Thailand and Cambodia. Being two middle-aged ladies was no barrier to us, but we did want something of an adventure by day, and be able to relax in comfort by night. Cambodia Cycling gave us everything we had hoped for. We originally chose this company for three reasons. 1. The ‘Bangkok to Angkor’ 8 day tour was exactly what we wanted. 2. We wanted to use a local company rather than a multi national. 3. It was the best price by far. I did the Bangkok to Saigon cycling trip in May and it was excellent. 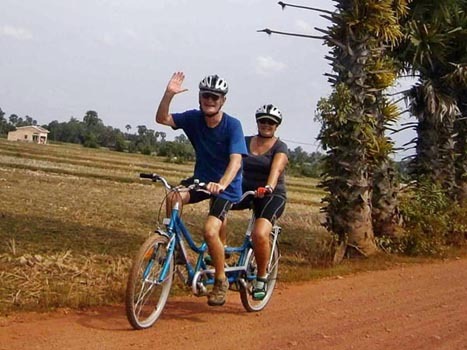 Initially during my research on tours, I was slightly concerned that Cambodia Cycling seemed to be cheaper than other similar cycling tours, however, I was pleased to discover that it offered great value for money. 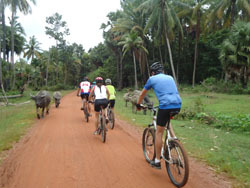 I would certainly recommend Cambodia Cycling to friends and family. 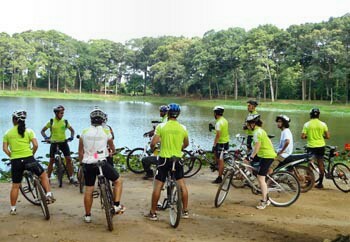 We did very much enjoy the bicycle tour with Cambodia Cycling. We want to thank you both and Three very much for the service. And we want to thank Cambodia Cycling specifically for the arangements for the tandem. Is it ok for you that we mention to others that Cambodia Cycling can provide a tandem as a part of the overall good service ? I just wanted to let you know I enjoyed my time in Cambodia, as well as the cycling trip. I really enjoyed Paeb (don't know how to spell his name) our cycling guide, and our driver (we called him Mr. T). Cambodia has some beautiful scenery, I loved the temples, had fun on the beaches, and have never seen so many friendly, smiling people as the Cambodians. Paeb spoke English well and was really friendly and accommodating. I'll write more later, but I didn't want too much time to pass before I sent my thanks. The riding experience of a lifetime! 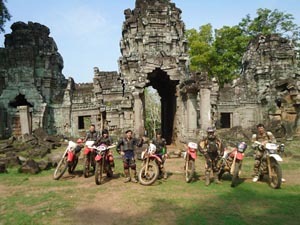 This dirt bike tour in Cambodia is by far the most difficult endeavor I've ever pursued. The roads can be treacherous! The difficulty can be extreme, but the beauty of the country side and villages far outweigh any of the potential dangers. From the awe inspiring Ang Kor Wat site, to remote temples where you feel like Lara Craft or Indiana Jones running around long forgotten ruins; between the chaotic streets of Phnom Penh and the small provinces where the local people are warm and welcoming; to the beautiful sunsets along the Mekong river resting beside bustling villages and thriving fishing towns; or to the travesties visited and uncovered by the genocide committed by the Khmer Rouge; Dirt biking in Cambodia will expand your mind on what you thought was possible from a culture so rich in history, yet it’s people are humble enough to make the country accessible to their guests visiting from far and distant shores. The basic setup and logistics required for a safe tour begins with your gear. I purchased a pair of boots and a fitted jersey for decent prices in America and had them shipped to Cambodia Cycling using FedEx(shipping was around $70). The rest of the gear including armor, goggles, and a helmet can be rented for less than $10/day in Cambodia. It’s a necessary investment! Secondly, to ensure a safe ride that visits a wide range of locations included the makeup of a tour group. I decided to go with Cambodia Cycling from four other companies since Hun Socheat was the most responsive in his emails and had the most in depth itinerary for the longest tour possible of 13 days. Also, his price was the best and in no way did I feel this dampened the riding experience. Hun managed to place me in very comfortable hotels and introduced me to local experiences, such as interesting types of food, that you wouldn’t get with any other tour guide. The team count required for this trip is at least two, but for the first half of the trip, we continued on with me as the solo tourist along with Hun as the tour guide and Tin as our trusty mechanic. The tour guide rides in front while the mechanic rides in the back, with me riding in the middle. For the first few days, this riding position made me feel safe and gave me the confidence to blast ahead. Hun takes care of the planning, but the arrangement seemed to be the best possible way to efficiently ride around the country. Timing is another factor and I couldn’t be happier that I did this tour near the end of monsoon season. Though the rain and mud can be frustrating at times, the challenge of the road, the pools of mud, and hours of cloudy conditions, actually made for a far more interesting and challenging adventure. Dry days meant dustier conditions and though getting stuck in six inches of mud can be infuriating, it’s a lot better than crashing into mud-turned-concrete during dry season. We certainly had to take more ferries and side roads since some paths were flooded, but the sun and rain made the country side that much more majestic. An interesting point is that the 250cc dirt bike is the road king out there. You’ll experience jeers and cheers and looks that make you feel completely awesome. Children will smile and shop keepers will go out of your way to make you feel at home. There were a very few vehicles that could go as fast as us off-road. We averaged 90kmh on dirt roads, 100kmh on paved roads, and a frighteningly fast 50kmh off road. I tended to keep it in 2nd or 3rd gear unless we were in the open where I let the throttle rip. I had very little dirt biking experience, but the tour guide will find roads for you that suit your ability. Also, if the roads became too difficult, I just took it slow and got thorough sure enough. Expect to fall, often. I sunk my bike a few times and took a bit of a beating, but nothing I couldn’t walk away from and luckily, no major damage was done to the bike. Hun and Tin were always there to pick me up from a hard fall and we took as many rests as needed. Being the sole member of the tour group meant I could take a day or two off to explore a city, as I did in Battambang, Siam Riep, and Preah Vehear, while cutting other cities or routes short to maximize my time in the places I enjoyed. Of course, expect to pay for day offs, but it’s well worth it when you’re doing a 2 week tour. Plan accordingly, but also expect the unexpected. An 11 hour riding day followed by shorter 4-5 hour riding days just means that you’ll have that much more time to explore a new location. Walk around and say hello to local people and you’ll often be asked to join them in a beer, or a meal, or a pleasant conversation. As far as the riding experience is concerned, there are some things you learn as soon as you hit the road. I realized that though you may have a 20 foot wide road, there are only 4 inches that are really good to ride on. You have to point your front steering wheel like a gun...to save your back and knees from all of the bumping and grinding. And when I mean precision steering, remember that most of the roads are built along sides of canals, mud plains, or fully irrigated rice fields. I found it easier to ride standing. So in an 8 hour session of riding, I found myself standing for 70% of it. I encountered countless narrow bridges, steep inclines, and unforgettable mud flats. In some cases, you’ll ride a few hundred meters through flooded patty fields which are quickly contrasted by busy shopping towns and rough, but highly congested, village roads. Zig zagging through herds of cows, running dogs, sleeping oxen, and scurrying chicken becomes normal after your first day of riding. The tour guide had an HD camera so I came away with some awesome videos. He also took some of the better pictures during the tour, so I recommend bringing a large thumb drive or small hard drive to store all of the captured images. The country is gorgeous, the people are lovely, and I couldn't have picked a better place to spend two weeks. We covered over 3,000 kilometers in 12 days of riding, with roughly 80% of it off road. I did some of my own exploring and covered approximately 150 kilometers on some of our off days. I'm a rider. It's the thing I most enjoy t o do when at home and when I’m traveling. There are things you do in life, struggles and responsibilities back home, or things you buy like a nice car or a bigger house, but if you really want to live life on the edge and experience something that will make you a wiser and perhaps a more confident individual; visit Cambodia and do this tour. Though I risked life and limb for this journey, all I can say is that the risk has been absolutely worth it! In fact, I loved the tour so much, I’m already planning on coming back with a few friends for a similar tour within the next two years. I feel lucky and fortunate to have found Hun Socheat and Cambodia Cycling as they offered a safe and flexible tour that covered a wide range of terrains, remote temples, and a sharing of knowledge through guided tours that I will never forget. In the end, expect to come out of the country with people who you’ll be glad to call your friends! During our charity cycling expedition, Cambodia Cycling showed a high degree of professionalism, flexibility, expertise in cultural knowledge and provided great catering. They're even helping us achieving our fundraising target! They made a tremendous positive difference in our cycling experience. Highly recommended! CUFA would like to use your services again next year for a similar program. Can you confirm at this stage that you would be available from the 05/06/2012-11/06/2012? 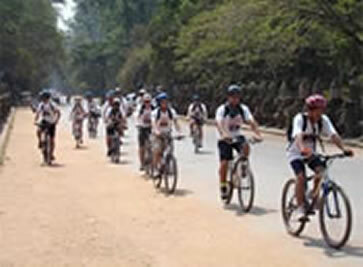 We could then discuss the itinerary and costs at a later stage, but we would like Cambodia Cycling Company to cycle to one or two of the schools with us and see what we do next year, so perhaps that is something we can add in. Georgie and I both enjoyed our trip. It was well organised and fun. Thanks to everyone again. We enjoyed our stay in Cambodia very much, and thought the cycle guide Mr. B San was excellent. His knowledge of the history of Cambodia and the temple sites was excellent. He was always friendly and and helpful. Your company provided good value for money, was reliable and provided all the things you said you would. 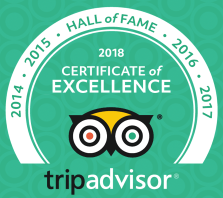 We would be happy to recommend your company to other tourists. I have just filled in the post scheme questionnaire but I also wanted to include a letter to say thank you again for everything. Our fantastic experience with The Leap was brought sharply in to focus when we did a volunteer project with another company, which was a disaster. This was the single best experience of my life, everyone was so helpful and made the whole process really easy. Socheat our project leader was beyond incredible…I only have good things to say! I had never done anything like this before but I know that all of my expectations were exceeded. The morning work in Samrong village was amazing. It was really good fun weaving the baskets (although I struggled a bit with the mats)! In the same way as the well, it was amazing to see a tangible finished project. I have so many pictures of her house in various stages of being built and finally when it was finished! It was a really amazing thing to be a part of. 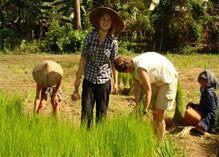 Building the paddy field was the hardest work I have ever done! It was particularly bad when it got to the point when Socheat turned around on the way back home and said, "It's getting really hot now". You can only imagine how hot Lara and I were!! It is also very cool to know that the next placement is going to be planting that field we laboured over! I will never forget Cambodia and my experience there and I know I speak for Lara and our families as well when I say how well looked after and safe we felt. Thank you again for everything! Thank you so much for your email. I really appreciate all your efforts. I mainly wanted to share with you, what an incredible experience we are all having. Though I am speaking on behalf of the others, we all talk a lot about how we feel about Cambodia, and I well and truly believe that you have given us every angle on the country. For that, I am eternally grateful. I have never been so involved, and felt like I'm truly being of service in a place before. Siem Reap is beautiful! I am very excited about returning there, and the new arrangements sound superb. Pnom Penh is fantastic! I was shocked (in a positive way, if that makes sense) byt the poverty that is ousted from the main city. It is a real privilege to be able to see how the majority live, and, not to sound overly cheesy, but it is certainly teaching me a lot, as it's a true awakening. The highlight at Trailblazer was certainly going out to deliver the filters, and seeing the rural communtities. Teaching at the orphanage there was such fun, and they have made tremendous progress in building the place in the short period I was there for. The children's English is surprisingly fluent! Here, the work is beautifully hard. I love waking up knowing I will see something that I am sure to remember. The Monks are a dream, they really are. Though I feel very attached to those adorable kids at the pagoda already. They are fast learners, and refuse to have a break from their lessons. The Nuns and kids at the afternoon school are just as bright and gorgeous! It is a pleasure teaching them. Plus I have aquired a new flower-making skill from my visit ti the community this morning. Of course, I have so much else to say, but I thought I would touch base and thank you for allowing me such an experience. It is more than what I could have asked for on this placement, and I really mean that. All is well here, you guys have done an amazing job at organizing us! We have met other people with different organizations who have not had such good experiences. The work is good, think we like the orphanage more then Trailblazers, we seem to clock watch a bit there but it's fine and does break the day up. Cambodia is an amazing country and I'm loving Siem Reap so far so no complaints from me! I am home now and already Cambodia seems very far away! Socheat and his family are amazing, you have found a gem there. If we need anything we ask him and he is very helpful. He is doing the volunteer work in Phnom Penh with us as well so he really cares. In terms of the work I have really enjoyed everything we have done. It's great that we have had such variety but at the same time I have felt as though we have had enough time to make a difference. The holiday was excellently organized with a good diversity of activities, accommodation etc. Restaurants were good and you were flexible with Sue's requests. Thank you for finding all the fruit many of which I had never had and some which Sue had not tasted. We were very well looked after. We enjoyed the home stay in Chambok as it made us appreciate electricity and facilities elsewhere. Dara (the driver for support vehicle) was very helpful and seemed to enjoy the trip which also helps. 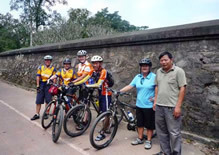 We have enjoyed traveling around Cambodia especially the cycling. The Khmers are a friendly bunch of people. Boeun was very informative and helpful. He was always making sure that we were ok and looked after us very well. You have been very good. It was very much appreciated. The drivers we had were very good, helpful and friendly. We liked Steung Siem Reap Hotel and Goldiana Hotel in Phnom Penh very much as the staff were helpful and friendly and the pools were nice. The home-stay in Beng Melea had good scenery. Overall you and your team have done a great job organizing the tour for us. We will definitely recommend your travel company and to our friends and families. The two days were great. So overall it was a great few days and great experience. I loved the Floating Villages, that was awesome. Second day was great too. The two places you chose for lunch both days were great!!! I liked the routes because they were different, one in the countryside, water, the other temples. Once again, the guide was great guy and terrific guide. I would like to come back to Cambodia at some time. Sofitel Royal Angkor Hotel is nice. We really enjoyed the 02 golf courses of 18 holes at Sofitel Phukeetra Golf and Angkor Golf Courts. The green at Sofitel Phukeetra is better. The tour at the temple wasgreat. All the ladies enjoyed the half day Spa package at Shinta Mani while we were playing golf. Thank you to look after them well. Thank you so much also to offer complementary massages to all our men at the Sofitel. A fantastic trip - with the temples Angkor a high point (one of many) for me! Our guide there, Sophoan Rath, was especially good - we highly recommend him for future tours. He was able to show us a large temple some miles out in the country, which was much appreciated and a bit of an extra effort for him.